Open to All Readers with the Ability to Play Region 1 Blu-ray Discs. Two winners will be chosen at random from the entries received via our official entry form you can find here The winners will be notified via e-mail following the deadline. A Fascinating And Enlightening Look At The Unshakable Bond Between Humans And Earth, Narrated By Oscar® Nominee Glenn Close, Debuts On Blu-ray And DVD June 5th From 20th Century Fox Home Entertainment: Specially Timed For World Environment Day As The First-Time Ever Simultaneous, World-Wide, All Format Release. Home by Yann Arthus-Bertrand will be broadcast in the US on June 5th at 9pm ET/PT exclusively on the National Geographic Channel, as part of the film's global premiere in conjunction with World Environmental Day. It’s too late… to be a pessimist when the inspirational, informative and breathtaking documentary, Home soars onto Blu-ray and DVD June 5, World Environmental Day, from Twentieth Century Fox Home Entertainment. 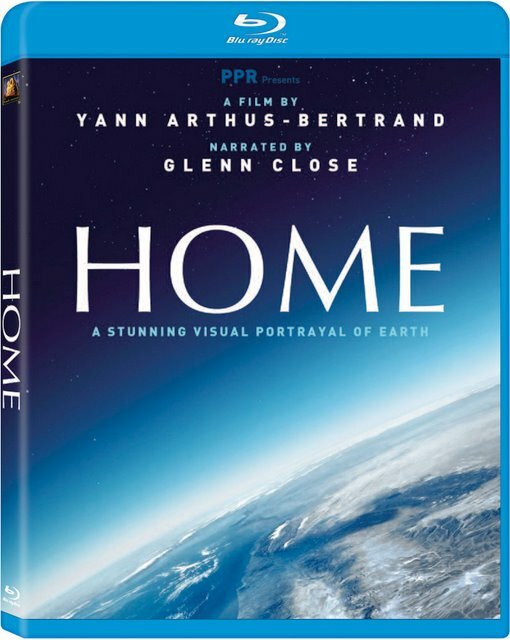 Directed by internationally renowned French photographer Yann Arthus-Bertrand, produced by world famous director Luc Besson and narrated by five-time Academy Award® nominee Glenn Close (Dangerous Liaisons), Home aims to change the way people see the planet and their impact on it. Shot in high definition in 54 countries and 120 locations over 217 days, the unique and first-time ever all-aerial filming style highlights the Earth’s wonders as well as its wounds and provides a necessary perspective to approach the changing environment. In 200,000 years on Earth, humanity has upset the balance of the planet, established by nearly four billion years of evolution. The price to pay is high as humankind has barely ten years to reverse the trend, become aware of the full extent of the Earth’s riches and change its patterns of consumption. Following in the tradition of Al Gore’s An Inconvenient Truth, Home sets out to shift people’s perceptions, inspire action and lay a foundation for the edifice that must be rebuilt. More than a movie, Home will be a major event all over the globe; for the first-time ever, a film will be released in every format, including in movie theaters, on television, DVD/Blu-ray Disc and the internet, on the same day in over 50 countries to reach the widest audience possible. The Home Blu-ray Disc is presented in widescreen format (1.78:1 aspect ratio) and features English 5.1 DTS HD-MA and French 5.1 Dolby Digital audio. Note: Originally Published in Jen's P.O.V. -- Misc. Reviews, News & Interviews. Be sure to check back often for updates or Follow Film Intuition on Twitter for the latest news.